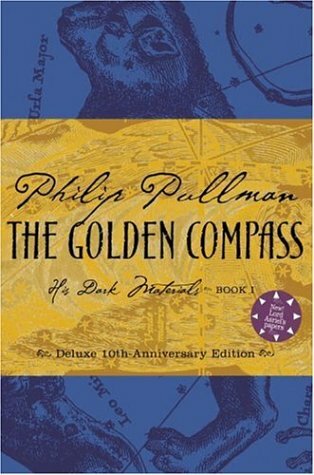 I’d never heard of Philip Pullman or His Dark Materials until they started making a movie out of The Golden Compass a few years ago, and then all the hubbub started about how, although it was written as a book for children, it wasn’t the kind of book any self-respecting religious person would let their children read. There will be a new Children’s movie out in December called THE GOLDEN COMPASS. It is written by Phillip (sic) Pullman, a proud atheist who belongs to secular humanist societies. He hates C. S. Lewis’s Chronical’s (sic) of Narnia and has written a trilogy to show the other side. The movie had been dumbed down to fool kids and their parents in the hope that they will buy his trilogy where in the end the children kill God and everyone can do as they please. Nicole Kidman stars in the movie so it will probably be advertised a lot. This is just a friendly warning that you sure won’t hear on the regular TV. With that kind of publicity, is it any wonder I wanted to read the book? Supposedly, the slam against God and the Catholic Church gets heavier and more transparent in the second and third books, and that may be, but in this first one, I’d have to say the claims that this volume will put your child’s faith in God in jeopardy are tenuous at best. Sure, the Magisterium is there, and it is equated with the Church (the Church of this mythical land we find ourselves in, in which people are connected to living animals spirits and in which bears talk and wear armor), and the main villain, Mrs. Coulter, is the head of something called The General Oblation Board which is somehow affiliated with it—but other than that, there isn’t much to start waving the sacrilegious stick at. Much of the novel is confusing in fact—confusing in a good way, I think, because the reader is shown everything through the eyes of the young protagonist—eleven-year-old Lyra Belacqua—and Lyra is still very much a child and doesn’t understand much about what’s going on around her. As she tries to figure things out, so do we, and Pullman shows some skill in keeping us engaged and guessing. Indeed, it wasn’t until the very end of the novel where I felt firm in my conviction that Mrs. Coulter was, in fact, the villain and Lord Asriel wasn’t—rather than the reverse. Lyra’s childlike thoughts and manner are refreshing in many ways, because they are largely honest and true to someone of her age. There are other fantasy novels featuring young heroes whose actions are anything but that of a child, but Lyra is one through and through. Lyra turned her back and closed her eyes. But what Pantalaimon said was true. She had been feeling confined and cramped by this polite life, however luxurious it was. She would have given anything for a day with Roger and her Oxford ragamuffin friends, with a battle in the claybeds and a race along the canal. The one thing that kept her polite and attention to Mrs. Coulter was that tantalizing hope of going north. Perhaps they would meet Lord Asriel. Perhaps he and Mrs. Coulter would fall in love, and they would get married and adopt Lyra, and go and rescue Roger from the Gobblers. These are typical thoughts she has throughout the novel. Childish thoughts. And I dog-eared this one pretty much at random. Little did I know at the time how prophetic this particular passage would be, for, as Lyra and the reader discovers much later, Mrs. Coulter and Lord Asriel were once married, and Lyra is, in fact, their daughter. I thought, oh no, not another one of those. A destiny that must be fulfilled, but only by a person unaware of it. We’ve encountered that trope multiple times before, and I usually find it tedious and anticlimactic from a storytelling perspective. The protagonist would be much more interesting and dynamic, I think, if they knew the consequences of what they have been called to do—and they actively pursue it anyway. And more importantly, those ultimate and hidden consequences of their actions might be a lot more ultimate if they were a lot less hidden. At least we wouldn’t be let down when we finally find out what all the fuss has been about. But in the context of Pullman’s supposed subtext—that of a child who, in her ignorance of religion has the freedom to act irrespective of its dictates and thereby neuters it—this typical trope takes on an atypically interesting spin. She must be free to make mistakes. In other words, there must be no consequences for acts in opposition to the dogmas of religion. Only in her ignorance can we be saved. A world where no one has been conditioned to follow dogma, everyone is free from its imprisoning effects. Maybe I should start another blog, this one only for passages in books that on the surface are about something related to the story, but underneath are the author saying something about writing. With every second that went past, with every sentence she spoke, she felt a little strength flowing back. And now that she was doing something difficult and familiar and never quite predictable, namely lying, she felt a sort of mastery again, the same sense of complexity and control that the alethiometer gave her. She had to be careful not to say anything obviously impossible; she had to be vague in some places and invent plausible details in others; she had to be an artist, in short. What should I call such passages? They are little like a boom microphone accidently hanging down into a shot during a movie, or the tip of a hidden handkerchief hanging out of the magician’s pocket. They are the building blocks out of which the complete illusion is made, and the reader is not supposed to notice them. But they seem to jump out at me. Always interested in the craft behind the art, I can’t help but think of the author with the pen pressed against the page, even during the most gripping of narratives. It keeps me from getting completely lost in the story, but it allows me to see things in ways others do not. When I read fantasy I completely immerse myself in the world the writer creates. All that he says is true I take as truth for the duration of the books. As a Christian, I too had heard the diatribes about His Dark Materials and it made me curious to read what all the fuss was about. In the end, after having read all three books, I thought he got so wrapped up in his point that he neglected the story. I liked the first book but liked the following ones less and less. It has been several years since I read them so no individual sections stand out, however I appreciate your note about building blocks. I'll be looking for them more as I continue my reading. Thanks for the comment, Sue. I have The Subtle Knife on my "to-read" shelf (I picked it up for a dollar at the library's annual used book sale), but I don't have The Amber Spyglass, and I probably won't get it until I'm through with The Subtle Knife and I'm sure I want to keep reading. The Golden Compass was good enough to get me to read one more, but not necessarily the whole trilogy. I'm envious of the way you can immerse yourself in the story. Reading books, watching movies--it seems I am forever thinking "how'd they do that?" instead of "what's going to happen next?" *smile* The ability to suspend disbelief does lead to a very full enjoyment of books and movies. It probably means I'd be a terrible writer but then again that isn't one of my goals. If you end up wanting the third book just let me know and I can loan you my copy.